Figure-ground perception is the ability to focus on one specific piece of information in a busy background. Visual figure-ground is the ability to see an object in a busy background; while auditory figure-ground helps a child pick out a voice or sound from a noisy environment. Click on the quick links below to jump to answers for your questions about visual figure-ground and some easy activity ideas. What do we use figure-ground perception for? 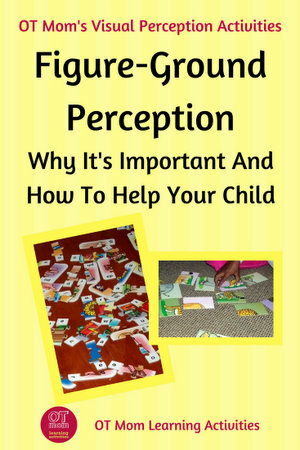 How does poor figure-ground perception affect a child at school? lose his/her place on the page while reading. These are fun for very young children, or for those whose figure-ground perception is really poor. Ask your child to find the matching sock, or pick out their own clothes from the pile. 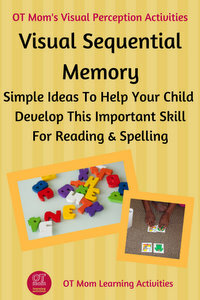 This will help your child to spot something important in a busy background. Give your child a bowl of mixed cereal or pasta to sort out into muffin or egg trays according to shape or color. To boost the FG requirement, ask your child to pick out only a specific cereal color or a specific pasta shape from the bowl instead of simply sorting them all out. Play “I spy with my little eye” games to help your child learn to look carefully and find objects in a busy background. Outdoors: You and your child can go on nature walks to spot birds, insects, plants etc. Older kids can look for numbers and letters in the neighborhood. Indoors: Have your child spot items in a book, or look for your groceries on a shopping flyer. “Lotto” type games will encourage your child to pay active attention to spot the small differences between the playing cards. Instead of playing them as a game, give your child a lotto board, and present a range of cards, asking which one fits. Mix up a variety of picture cards and ask your child to find a specific picture. Increase the figure-ground demand by adding more cards to the “pool” so your child has to find the card in a busier background. When doing a jigsaw puzzle, encourage your child to look for the small details. For example, pick up a piece, point out a specific color/shape/object on the piece, and ask your child to find a piece that has the same color/the rest of the object on it. Obviously, start with puzzles with fewer pieces! If your child struggles with the concept of puzzles, read my article on teaching puzzles. Your child will need lots of encouragement if they usually avoid this type of book – encourage your child to pay attention to detail, and show them how to systematically work through the page. Many libraries and second hand book stores stock a range of "Where's Waldo? ", "I Spy" and "Usborne Puzzle Books". Usually, I let the child scan the page first, and if they do not find the object, I will work with them systematically. You can ask your child to look in specific areas of the picture – "Have you looked in the house? ", "How about the tree?" In this way, you can systematically cover all the main areas of the page. Or you can show your child how to move a finger across the page and have the eyes follow the finger. Work from left to right, gradually moving down the page. For your convenience, I have linked to similar products on Amazon - I receive a small commission if you purchase something through the links below, which helps support this site. However, you are under no obligation to purchase anything! 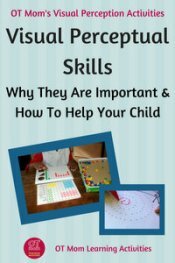 Worksheets that present spot-the-difference, mazes, hidden pictures, word-searches and color-by-number activities are all helpful in building skills. 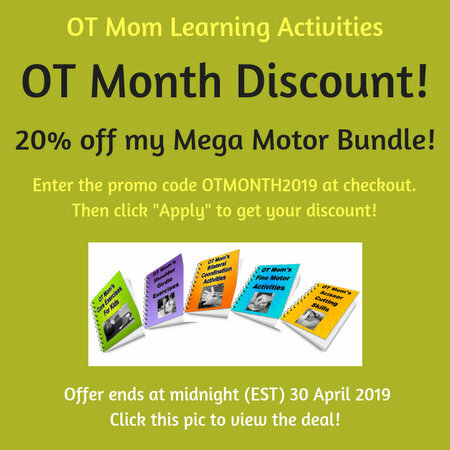 However, kids with poor figure-ground perception often don’t know where to begin to do these activities as the visual information is overwhelming. Sit with your child and help them to make sense of the worksheet and to develop strategies for completing the worksheets. 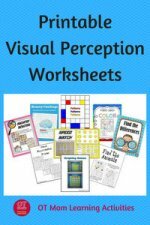 Check out these visual perceptual printables for some lovely reusable worksheets you can download . Rather than reinvent the wheel, I am going to point you to another therapist's helpful article! If you are looking for some resources to help develop your child's figure ground skills, then check out these ones that I have sourced. Toys and Games to boost visual perceptual skills. These products are popular with therapists and can make great gifts for kids who need to work on these skills! 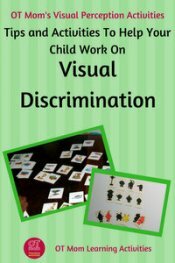 Worksheets: Although I prefer hands-on activities, there is sometimes a place for using visual perception worksheets to help consolidate kids' skills. These are my favourite printable downloads - click on the image to view them! I hope you found this information useful! Children with poor figure ground skills may also struggle with other visual perceptual skills as well. So take a look at my other pages to be inspired with more activity ideas. Thank you for visiting my site! Why not sign up for my free, occasional newsletter to stay in touch with new pages and activities on my site?